2. the allusions to the East Anglian royal family provided by the famous Northumbrian monk Bede in his early eighth-century Historia Ecclesiastica. 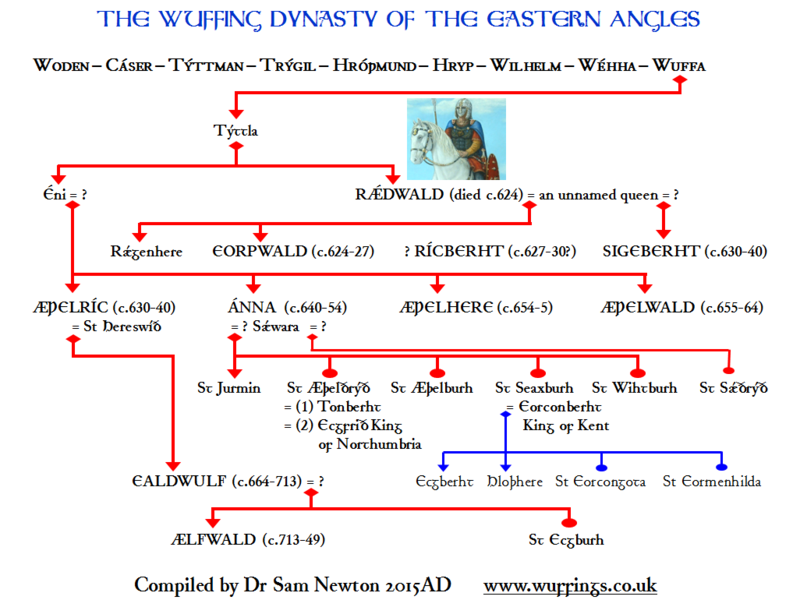 Section A gives the order of names contained in the upper reaches of the genealogy, descending from the ancestral father-god Woden to the eponymous personification of the family totem, Wuffa, ‘Little Wolf’. Click here for Section A of the Wuffing Genealogy. Section B presents information on some of the more solidly historical Wuffings up to 749. All of the names in Section B are linked to individual pages summarizing what is known or can be deduced about these names and their bearers, with references. Section C provides a Regnal List of the later Wuffing Kings, from the death of Ælfwald  to the last of the famous Wuffings, St Edmund (20th Nov. 869). Click here for Section C.